The hosts had plenty to spare in their 39-17 semi-final defeat of South Africa. 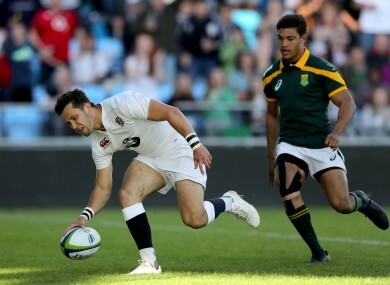 Max Green touches down for England. NIGEL CAROLAN’S SIDE will have to overcome hosts England if they are to become the first Ireland side to win the World Rugby U20 Championship. After an emphatic 37-7 win against Argentina earlier this evening, Carolan’s charges became the first Irish side to reach the decider, continuing their fine form in the competition after wins in the pool stage against Wales, New Zealand and Georgia. England also made light work of their semi-final this evening, recording a 39-17 win against South Africa at the Manchester City Academy Stadium. First-half tries from Max Green, Huw Taylor, Sam Aspland-Robinson, John Bleddyn Rhys Williams and Max Malins saw the home side build an emphatic buffer. And with Harry Mallinder adding six points from the boot, England took a 31-3 lead in to the break. South Africa made a number of changes just six minutes into the second half and they coincided with a well overdue comeback. The visitors breached the England line twice in a a three-minute spell, first on 48 minutes, through Edwill van Der Merwe and Curwin Bosch. And with Bosch adding both conversions, England’s lead was cut to 14 points (31-17). But the home side managed to repel South Africa thereafter, adding a penalty through Mallinder and a late try through Max Wright, to ensure they will face against Ireland in the decider. Carolan’s side will be full of confidence ahead of Saturday’s (7pm kick-off) final at AJ Bell Stadium in Salford after such an impressive campaign. England have won two of the past three titles (2013 and 2014) and this will be their fourth straight final but it was the Irish who prevailed when the two sides clashed in the U20 Six Nations earlier in the year. Email “Ireland to face England in World Rugby U20 Championship final”. Feedback on “Ireland to face England in World Rugby U20 Championship final”.